Hi there! I'm Maggie, or "Maggie Waggie" as Mom likes to call me - 'cause my tail is always wagging. 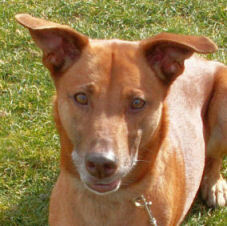 I am a mix of shepherd, lab and whippet. I was born November 21, 1999 in Sooke, and went to live with Mom when I was nine weeks old. She adopted me the day before I was to be surrendered to the SPCA. Now I'm living the good life in Crofton with my mom Kelly and my canine siblings Boom-Boom, Reckless, Kybosh and Little Monkey and Quincy the cat. Mom and I started training in flyball in February 2005. I'm a busy girl, and I love tennis balls, so Mom thought flyball would be a fun and exciting way to keep me occupied. I think she was right! As much as I love flyball, I haven't made the training TOO easy on Mom. I like to do things my way, and I guess my stubborn streak has made Mom kind of frustrated at times (hehe!). All that hard work paid off when I finally got to race for real though - Mom was so happy that I did my job right, and passed other dogs, and kept my head on straight! I'm retired from racing now, but in my day I ran an average of 5s in the pack, and was clocked as fast as 4.65s in start position. Now that my flyball days are over, I occupy my time fetching the ball and playing with my siblings. 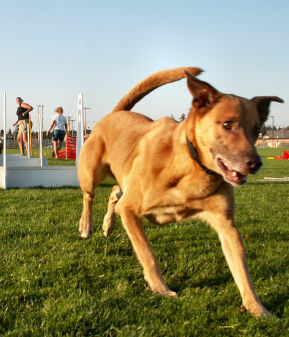 I'm also an agility dog, and I love that sport! I have a long list of tricks too - roll over, weave through Mom's legs, speak on command, bow and spin - the list goes on! I guess Mom's gotta do something to keep an active, intelligent girl like me from getting in to trouble!